Click Here for Summer Application for Free Meals - Available Now! 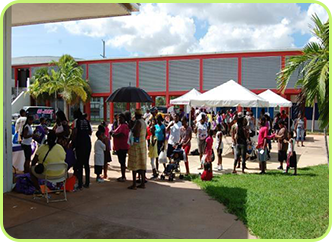 Summer and after-school programs are held throughout the year at various community locations. The programs seek to address academic and social needs for youth between the ages of 5-17. In 2014, we provided after-school tutoring to over 500 youth in Miami-Dade and Broward Counties. Ninety-four percent of participating youth in Miami-Dade County Public Schools and 98% of participants in Broward County Public Schools showed improvement based on pre- and post-assessments. Summer programs include music (vocal and instrumental), dance (hip-hop, liturgical, and ballet), STEM, and martial arts. The after-school and summer program budget, which serves 300 youth, is $390,000 (approximately $1,300 annually per child). Partial funding is provided by the FLDOE, DCF, and community partners. Tuition for some students (based on income) is estimated based on a sliding fee scale. Each summer through our partnership with the 34 Ways Foundation and Florida A & M University (FAMU), we select 12 high school juniors to attend a two-week visit on the campus of FAMU to learn about STEM research and agriculture. The two-week stay is partially sponsored by the 34 Ways Foundation and community partners.